Metric air hose connector fitting. Quick-install and quick-release for 6mm OD plastic air line. 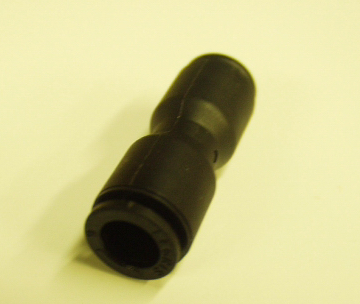 This coupler makes splice modification or repair of damaged air pipes in Range Rover air suspension ("EAS") easy. Hooks two loose ends of air hose together: No additional parts are needed to splice Rover EAS air suspension hoses: seals and collars are integral in this part. Way better part for way less than Atlantic British! This is the size for the lines to the air springs, for example, on Classic, and P38a where it often fails in the area of the right front, beneath the battery. Also repairs 6mm air hose used on HSE, Sport, LR3 and LR4. Made from glass reinforced nylon and stainless steel this re-usable part is a permanent fix. Rated at 290psi. Commercial grade version of Land Rover's STC850G (supersedes FW51). Land Rover air suspension operates in the range of 148 to 168psi. Beware not to use similar parts rated for pressures much less than 250psi. See box below for quantity discounts. We also stock 4mm and 8mm versions of this fitting.